Insight uses the Internet to validate your licence token and to check for update notifications. Some network configurations require the use of a proxy to access the Internet, and your IT Department will be able to confirm if these are necessary from your location. These settings can usually be found in the Network Configuration of a web browser such as Mozilla Firefox or Internet Explorer. If you are unable to locate them, please consult your IT department. 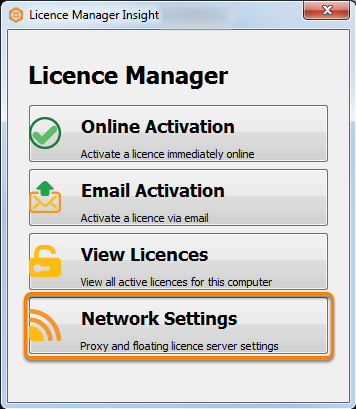 NOTE: You may need to add exceptions to the firewall and/or proxy server to allow Insight to communicate with the licensing server. For details, see Firewall Configuration. If you have received the error message above, it is probably caused by an incorrect proxy setting. 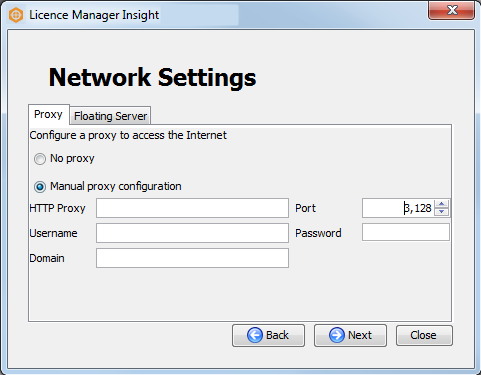 Click on Configure Network to check your proxy settings. This will open the Network Settings window. Under the Proxy tab, select Manual proxy configuration. Depending on your system, you may not need to fill all the fields. Note: If you are unsure about how to configure your proxy settings, please consult your IT department. 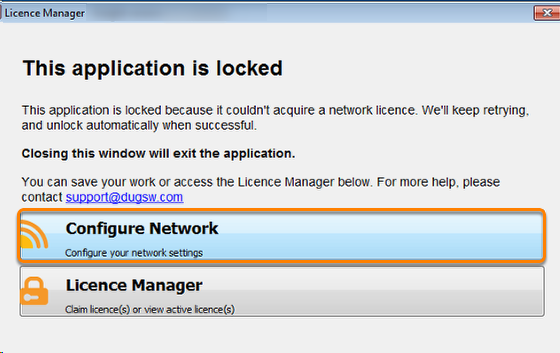 Alternatively, you can configure your network settings via Licence Manager from Insight. 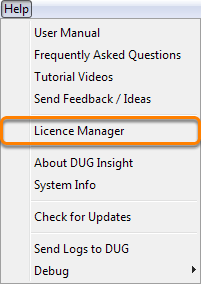 In the Control Panel, go to the Help menu and click Licence Manager. Click Network Settings to view and configure the settings.